Snowbasin, Utah – September 15, 2015 – The last weekend for summer operations at Snowbasin Resort is full of fun activities to say goodbye to summer and get excited for our 75th Anniversary winter season. 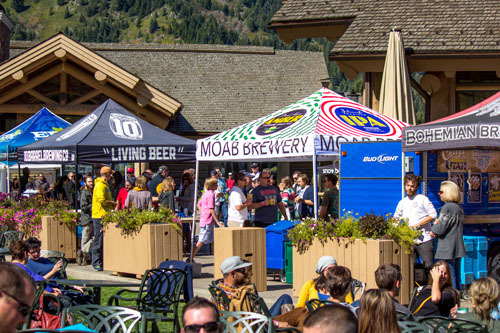 Snowbasin Resort’s third annual Basin Beer Fest will be on Saturday, October 3 from 12:00pm – 6:00pm. Young Dubliners, Andy Frasco and Swagger will play free live music all day long while guests sample all of the best local craft beers. Basin Beer Fest will feature beers from Bohemian Brewery, Uinta Brewing, Squatters Beers, Wasatch Beers, Red Rock Brewery, Roosters Brewery, 10 Barrel Brewing Company, and Payette Brewing Company. Admission to the Beer Fest is free and 7 oz. samples of beer are available by purchasing tokens at just $2.50 each. The Basin Beer Fest menu includes Oktoberfest inspired cuisine such as bratwurst and sauerkraut, chicken schnitzel, knackwurst platter, sauerbraten fries, German Black Forest cake and more. On Sunday, October 4, start dreaming of winter at the Pray for Snow Party on the last day of summer operations at Snowbasin Resort. From 1:00pm – 4:30pm on Earl’s Lodge Patio, enjoy free live music from Andy Frasco & the UN and Folk Hogan, a beer garden featuring Pray for Snow Winter Ale by 10 Barrel Brewing, classic ski flicks and cocoa drinks to get ready for an awesome winter ahead! Kid’s activities include the spider jump, playground and climbing wall. This is the perfect opportunity to pick-up your Season Pass so you are all ready for opening day of our 75th Anniversary Season as well as the last chance for the best prices. Season Pass prices increase October 5, 2015. This time of year is also peak fall foliage viewing time, don’t miss the last weekend you can ride the gondola up for panoramic views of all the beautiful colors. The perfect opportunity to bid adieu to summer and start looking forward to an awesome winter ahead! For more information, please visit http://www.snowbasin.com or call (801) 620-1000. Snowbasin Resort is located less than 35 miles North of Salt Lake City, with one of the easiest drives from Salt Lake International Airport as well as quick access to the Park City Area and Downtown Ogden. With 3,000 skiable acres and 3,000 vertical feet, Snowbasin Resort is best known for wide-open bowls, gladed runs, manicured groomers, powder stashes days after a storm, and excellent service. Enjoy award-winning cuisine including mountain top dining with spectacular views and magnificent day lodges. Discover why Snowbasin Resort is consistently recognized as one of the best family resorts in North America!